Welcome, from Mayor Dave Berger! I continue to be privileged to serve as Mayor and Chief Executive for the City of Lima, work that is important and immensely gratifying. And because we are in mid-course on a number of important projects, I have decided to again seek re-election in 2017 and hope that you will join in the campaign for my re-election. The Berger for Mayor Campaign is dedicated to engaging with voters, sharing information about the ongoing and positive changes occurring in our community, and asking for your engagement and support. I look forward to working with you and our neighbors as we strive to make Lima the best community possible. We Support Dave, And We Hope You Will To! Berger for Mayor Campaign declines to participate in NAACP sponsored Debate: Read the entire letter here! Mayoral Debate scheduled for September 27th. Upon receipt of the invitation, the matter was put before the campaign team for discussion. While this matter was still under discussion, the Lima NAACP Unit held its Freedom Fund Banquet on August 19th at which Dave Berger's opponent delivered the keynote address. Shortly following that event, it was brought to our attention that a member of the NAACP leadership team made public comments that we believe amount to a public endorsement of Dave's opponent. Specifically, Dr. Carol A. Fails, NAACP Unit #3170 Education Chair, posted on social media a video of Dave's opponent speaking at the August 19th Freedom Fund Banquet with the comment "Mr. Keith Cheney, hopefully the next mayor." This comment is of particular concern due to the fact that the national NAACP organization specifically prohibits units' engagement in political campaign activity. (See Attachment). Moreover, these comments put into serious question the Lima NAACP Unit's ability to be fair and impartial to all candidates. We believe that there should be free and open debate on the issues facing the city of Lima and that any forum for those discussions should be fair and impartial. Dave does not support "Right to Work" laws like his opponent. Dave believes in an economic policy that produces good jobs with good pay and benefits. That is why he supports the right to organize. We have seen in Lima that policies that support workers help move people from poverty to middle class. Dave supports raising the federal and state minimum wages to a Livable Wage. Dave believes that if someone works 40 hours a week, he or she should be able to make ends meet. Dave supports a truly progressive tax system in order to close the gap between the very rich and the poor. Dave supports the Affordable Care Act and in fact promoted enrollment in its coverages. Dave believes that we should provide all our children a world-class education, beginning with early childhood through college. We must prepare all our students with the 21st Century skills they need to succeed in life, either in the trades or in professions. Dave supports Business, both large and small. Dave believes that we must continue to encourage and support entrepreneurship in the city of Lima. Dave has been fighting for Lima for almost 3 decades, saving our refinery and tank plant multiple times. Lima now has its best economy in more than 40 years. Dave is committed to strong Community Policing efforts. From 2008-2016 crime is down in Lima by 23% and headed further down by double digits once again this year. Dave believes that we must remain tough on violent crime, and continue pin-point policing to remove illegal guns and drugs from the street. And we must also get tough on the root causes of crime by investing in proven initiatives that get youth and nonviolent offenders back on track through education and training. Dave also believes that the city's work force, in particular, its safety service departments should reflect the demographics of our city. Because of this conviction, for years he has called for changes to the civil service rules to allow the City Administration to consider any applicant who successfully passes civil service tests. Dave continues to publicly call for the Civil Service Board and Lima City Council to enact those changes. In recognition of the public health epidemic of opioids and heroin, Dave is fully engaged in the Opioid Action Commission, actively supporting law enforcement targeting drug dealers, encouraging health care providers to expand treatment options, and working on community education and outreach to change the consumption of prescription pain meds and illegal drugs. Dave believes that it has been wrong for the State of Ohio to take over $3 million dollars a year from the city of Lima to build up a multi-billion dollar "Rainy Day" fund in Columbus. Our community needs this money and it should be restored. 5) Improve the Health of Lima's Neighborhoods. To achieve this agenda, Dave will continue to partner with Democrats, Republicans, Independents, and all citizens of all races, genders, sexual orientations, and socioeconomic backgrounds of Lima to Keep Lima Moving Forward. For the above stated reasons, we thank you for your attention, and we respectfully decline the invitation to participate in your debate. Although NAACP units are 501 tax-exempt organizations, the national NAACP is a 501 (c)(3) organization which is restricted in how it can assist people in registering or getting out to vote. In addition, NAACP policy specifically prohibits units' engagement in political campaign activity. This means that NAACP units cannot endorse or oppose candidates running for public office, make financial or in-kind contributions to candidates, political parties, or PACs, or engage in other activity that is designed or targeted to influence the outcome of any candidate election. However, the prohibition against NAACP units being involved in political campaign activity does not mean that they have to sit out of the upcoming election. In fact, the NAACP can and does engage in a wide range of election-related activity without jeopardizing its tax-exempt status -- from sponsoring voter registration drives and educating people about the issues to encouraging people to vote and giving them rides to the polls on Election Day -- as long as the activity is nonpartisan. So to summarize: because of the law and long term NAACP policy, NAACP units do not engage in partisan political activity. However, the NAACP has a long and proud history of engaging in nonpartisan voter registration and get out the vote efforts. Latinos and other people of color, low-income people, the homeless, women, students, immigrants, etc. When discussing issues in connection with its nonpartisan election-related work, NAACP units should not discuss them in a way that reveals their positions on the issues or that encourages people to support or oppose certain public policies. For example, an NAACP unit could print and distribute a flyer that said: "The next election will determine the future of affirmative action in our state. Register today and let your voice be heard," or "The upcoming election will affect public education, taxes, welfare reform, housing, and human services. Register to vote and have an impact on the decisions affecting your life." But an NAACP unit could not distribute a flyer that said: "Oppose vouchers. Register to vote here," or "Register to vote and join us in standing up for affirmative action." NOTE: The prohibition on NAACP units being involved in political campaign activity does not prohibit them from supporting or opposing ballot measures, i.e. referenda, initiatives, constitutional amendments, and other legislative issues decided directly by a vote of the electorate. Work on ballot measures is considered to be lobbying — not political campaign activity — and NAACP units are permitted to lobby. Therefore, the restrictions on nonpartisan communication described in this manual only apply to the NAACP's ability to do election-related work in connection with candidate elections — not to work done in relation to ballot measures pending before the voters. Disclaimer should read: "Our voter registration services are available without regard to the voter's political preference. Information and other assistance regarding registering or voting, including transportation and other services offered, shall not be withheld or refused on the basis of support for or opposition to particular candidates, parties, or policy positions." Inform people of their right to vote, explain how to work in an election campaign, or tell them when and where to vote on Election Day. Distribute material educating voters about the issues at stake in the election — include the following disclaimer on any voter education material distributed by the NAACP unit. Disclaimer should read: "This voter education material is nonpartisan and is in no way intended to reflect an endorsement for, or opposition to, any candidate, political party, or PAC." Target African Americans, Latinos and other people of color, low-income people, homeless people, women, immigrants, and other underrepresented or disadvantaged groups for your voter registration, education, or GOTV activity. Invite all candidates running for a particular office to attend a candidate debate at a NAACP unit event to discuss their views and answer questions posed by members of the community. Produce and distribute unbiased candidate questionnaires covering a range of issues that are based on written surveys of all candidates. Invite a candidate to speak at a NAACP unit event -- as long as you extend the same invitation to all other candidates in the race. Urge voters by phone, door-to-door canvass, or public service announcements to remember to vote on Election Day. Provide voters with rides to the polls on Election Day. Make oral or written statements supporting or opposing a political candidate, party, or PAC. Tell individuals, communities or voters which candidates they should vote for. Contribute money to, or provide services for, a political candidate, party, or PAC. Work with a political candidate, party, or PAC in planning or carrying out nonpartisan voter registration, education, or turnout activity. Allow a political candidate, party, or PAC to distribute campaign or other partisan materials on the NAACP unit's property. 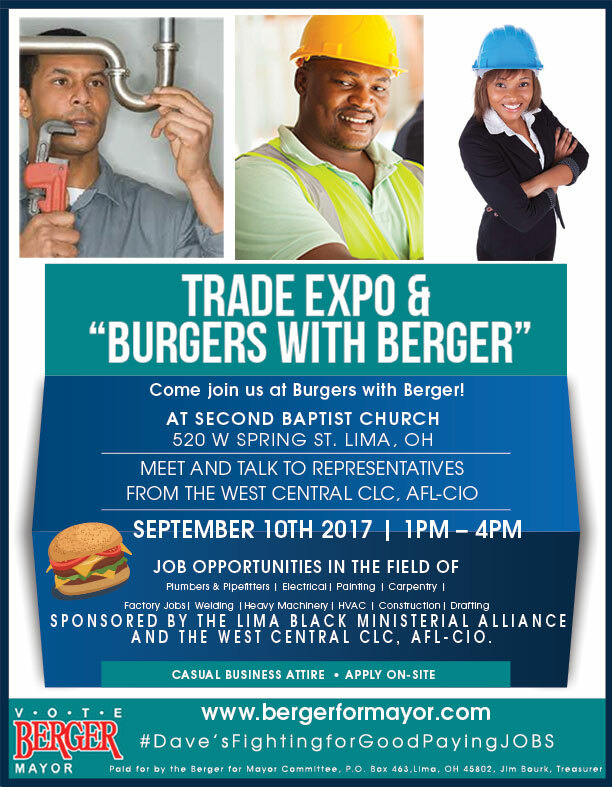 Trade Expo & "Burgers With Berger"
Come Join Dave for the Trade Expo and "Burgers with Berger" event. Representatives from the West Central CLC, AFL-CIO will be present to talk with the community about the abundant opportunities in Lima. Special thanks to the 25 Lima residents who participated in the Community Conversation meeting this evening. Expressing concerns, discussing opportunities and sharing positive solutions for current issues is how we make our community stronger. Thank you.